The Evidence: Wellbeing and Engagement was published by the Thought and Action Group examining wellbeing. 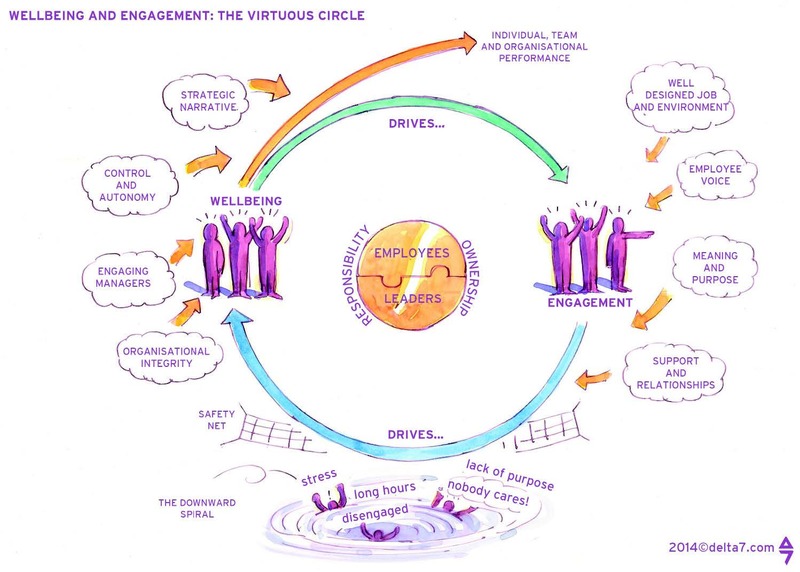 The Group was launched in August 2013 to build on the paper “Why Wellbeing Matters: Sustaining Employee Engagement and Performance” and chaired by Wendy Cartwright, former HRD for the Olympic Delivery Authority. The evidence in this paper has been drawn from three distinct perspectives: academic research, research by consultancies and organisational case studies. There are small case study vignettes in the main body of the report, but more detailed case studies for each of these are available on this website. The paper sets out the evidence for the linkage between employee engagement and wellbeing, and the consequential impact on individual and organisational performance. It is written for an audience of Chief Executives and HR Directors as well as wellbeing and employee engagement specialists – whether they may work in-house or as external consultants. That said, we hope this will be a useful paper for all managers and leaders, regardless of whether they work in public, private or not-for-profit sectors, and regardless of organisational size. The paper builds on, and is complementary to the paper entitled Nailing the Evidence, which Engage for Success published in November 2012. Our intention is that this Wellbeing and Employee Engagement report will add to the increasing body of evidence that demonstrates why employee engagement and wellbeing matter to workers and help drive sustainable organisational performance outcomes. The below images found in the full report, created by Delta 7 are resources that organisations may use with attribution. Please right click and save.